The Bakerloo line is a line of the London Underground, coloured brown on the Tube map. It runs partly on the surface and partly at deep level, from Elephant and Castle in south-east to Wealdstone in north-west of London. The lines serves 25 stations of which 15 are underground. It is the seventh busiest line on the network and platforms are 110 metres long. Note: For the former Stanmore branch of the Bakerloo line, see the Jubilee line article. Harrow & Wealdstone 16 April 1917 Closed: 24 September 1982. Service restored: 4 June 1984 . Kenton 16 April 1917 Closed: 24 September 1982. Service restored: 4 June 1984. South Kenton 3 July 1933 Closed: 24 September 1982. North Wembley 16 April 1917 Closed: 24 September 1982. Wembley Central 16 April 1917 Opened as Wembley Central for Sudbury. Marylebone 27 March 1907 Opened as Great Central. Lambeth North 10 March 1906 Opened as Kennington Road. The extension to Camberwell was a plan to extend the Bakerloo Line. The project was to start at the late 1940s, but they cancelled it for an unknown reason. Then in the 21st century, they revised the extension plan and proposed it again. So far, nothing has been agreed. The 1940s version of the extension had two stations. One rumour of why they cancelled the project was because Camberwell was quite a bad location to do further extensions. 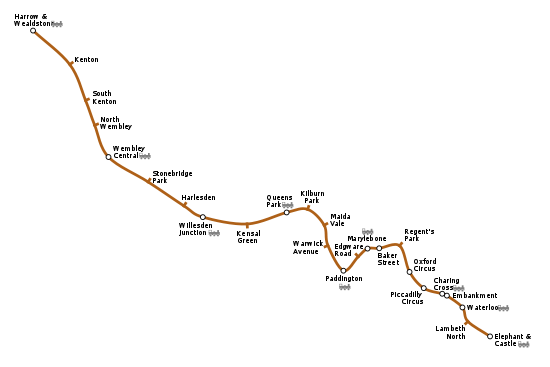 Between 1917 and 1982, Bakerloo line trains continued along the DC line past Harrow & Wealdstone to Watford Junction. These stations continue to be served by London Overground. Pinner & Hatch End 16 April 1917 24 September 1982 Renamed Hatch End (for Pinner): 1 February 1920. Renamed Hatch End: 1956. The Stanmore branch was originally constructed by the Metropolitan Railway (now the Metropolitan line) and was transferred to the Bakerloo line in 1939. It was transferred to the Jubilee line on 1 May 1979. It connected to the main line at Baker Street. ↑ "Inter Station Database". Transport for London. 26 July 2006. Retrieved 1 March 2014. This page was last changed on 26 July 2018, at 08:12.